It has to have been 4 or 5 years since I’ve seen a recent Simpsons episode. After catching up on the last few episodes, I can really appreciate how “with it” the Simpsons have been. After all, it’s gotta be relevant if being parodied by the Simpsons. Particularly relevant is episode 21, where Bart’s teacher is replaced with a younger, hipper instructor, Zack– who turns what all the students consider to be “fashionable” into something functional. Zack: “Are you telling me you memorized that fact, when anyone with a cell phone can find it out in 30 seconds? The need for accessible procedural literacy is not a new idea. Just like opportunities afforded by traditional literacy, it is obvious that a divide will occur between the advantaged, procedurally literate and the rest. Right now, it is the case that a clear advantage goes to those who understand how computers work, how to use web 2.0, and own mobile technologies (as parodied by the Simpsons.) Eventually, those with really really good memories may stay ahead in the race, but for the average person, not fully using our extended cognition will leave us in the dust. Hulu: Simpsons, Season 21 : Ep. 2, from 7:44 to 9:26. Teacher uses technology to engage students. At the Digital Humanities Conference this year, I learned of the work going into the accessibility, organization, and processing of the information overload produced each day. With all the stuff and information we live with, traditional approaches to managing our time, organization, and communication is changing faster than we are able to adapt. As the upcoming next generation of academics, I feel it is our responsibility to reform the way we are adapting to our new technology. Creating something does not mean we will use it appropriately, nor that its benefits won’t come at the cost of something else. On the other hand, the attitude “think about before all this existed— people did fine” clearly mistakes the gadgets and observable manifestations of technology, for the conceptual advancements that they represent and employ. In another light, with all the information out there, on the news, in commercials, in advertisements, on the internet, on television, how can anyone know what to believe these days? I know I’m left with a constant feeling of being manipulated. Recently, I saw a video that presents information quite well. At the very least, it convinced me that aesthetically pleasing videos packed with statistically significant facts is, probably, the most effective way to spread a message or “truth.” Yet with such a well put together presentation, how do I know that this isn’t just a new way to manipulate my thinking? At the very least, this video made me reevaluate my life, which, in the midst of so much information, is an impression I’m rarely left with. Zack, Bart Simpson’s substitute teacher, eventually goes on a drunken tirade and gets himself fired for his repressed animosity against the education system. Bart uses an over-the-top self-help book, which many find to be deprecated technology, to get his original teacher’s life together. Education, books, pedagogical practices, and modern technology were all their own useful advancements. Change isn’t a bad thing, but only if we actively try to make it good. And if things are changing at a faster rate than we can manage, then our (lack-of) reliability will show for it. Eventually, we’ll need to optimize ourselves, since we only have 24 hours in a day and a finite amount of memory. I study and create technology, but it is also important that I know how technology is received, used, and understood. Otherwise, I may find myself contributing to a greater problem at hand. These days, I find that always having to catch-up with myself, is not how I’d like to live the rest of my life. My “starred” g-mails don’t ever seem to go away, and the overhead to doing things seem to be annoyingly greater than necessary. Our we just absurdly impatient?… perhaps, but the input of responsibilities grow at such a rate that our output can’t continue to keep up. There are just more things to say no to, except everyone is too busy to read that email, much less reply. In the midst of all that we are creating, defining, and doing, how can we even keep track of what everything means? What then is “truth?” Is it absolute? relative? subjective? pluralistic?… Perhaps, we are approaching the age of “procedural” truth and simple facts just won’t cut it anymore. This entry was posted in Academics and tagged education, procedural literacy, simpsons. Bookmark the permalink. Both comments and trackbacks are currently closed. Can you say more about the connection between procedural literacy and memory? They seem unrelated to me. Love the flow chart. I’ve been providing that service to friends and family for years. I’ve never once have seen it expressed so succinctly. I did get my tech phobic Mom to install Norton just by talking to her over the phone. A friend had sent her a virus. It took us all day, but she did say that she loved me afterward, as only your Mom can. Just to set the record straight, Bart slipped booze and cough syrup into Zack’s Red bull. Zack did not go on an intentional drunken tirade. Bart had played the same trick on to his teacher, Edna Crabapple. She was fired and replaced by Zack as a result. Bart was just trying to set things right. I’m pretty sure I’ve watched every episode of the Simpsons at least twice. I even sat next to Nancy Cartwright (Bart) in a writing class last January. She’s a very nice, funny person, unlike Bart. I’ve admired the cultural critique that he writers of the Simpsons have kept fresh for so long. I’ve been a long time fan of Harry Shearer and listen to his radio show every Sunday morning (or on the web). Your commentary on procedural literacy gets at a very important issue and I quite agree with your point. I’ve gotten into the habit of having Google, Wikipedia, IMDB, etc. open and in use when discussing a wide range of topics with friends and colleagues. It is often more important to know who believes what, than what the truth really is in terms of facts. Many people can be convinced that a ‘truth’ exists, just by presenting links to a viewpoint expressed on the web. Many people are quickly annoyed at any attempt to ‘prove’ something. Bertrand Russel must be spinning quite rapidly. Do you mean when I am writing about the finite-ness of the rate that we do things? Or when I mentioned that people with really good memories may stay ahead of the race? The former is to point out that, given limited resources, we need to optimize procedures for maximum output. The latter was to, sort of, show the advantaged|disadvantaged divide. Clearly, traditional literacy provides much leverage. Similarly, knowing how to use and having access to computers provides another advantage. This *need* for procedural literacy, of course, does not make such a distinctive divide just yet. Currently, the evidence that it would benefit us to use technology, whether hardware, software, or algorithmic, can be found by examining the disconnect between our reliability and expectations of reliability in our own lives. As we are going beyond intrinsic cognitive abilities, there will eventually be an additional divide between those who have access to the non-intrinsic or peripheral cognitive abilities. Memory (and memory accessibility) was used there as a typical example of an intrinsic cognitive function that would uneven the playing field. I think this story a professor told once about some MIT student with photographic memory and graduated top of his class. When he entered industry, they found out he had no problem solving skills. People with good memories may stay ahead of the race, but not indefinitely. That’s not to say that using something that does procedural things makes you procedurally literate… rather, to truly use a tool appropriately you have to know how it works, at least at a high level. Whereas, people who use technology to be “fashionable” would not be procedurally literate. That’s why I started discussing how not knowing what we are actually optimizing or what our technology is doing just results in wasted time and unusable information. that poses quite a few interesting questions. I think now that the amount of information doubles every 5 years, we need some kind of AI not to get swamped in it ourselves with our dumb 0/1 computers. Extended mind FTW! If only I had access to it during my school tests! It’s nice to see more schools embrace technology, especially making use of the social media and social media tools available these days. Loved the flowchart by the way. This so relates to my work environment! Thank you for lettimg me get a few laughs out of it as well. Sherol Congratulations, you have the great ability from drawings (ironic, of course) that parodies society today, draw a diagram show go and very intelligent, I’m going to send my friends. “Thoughtlessly using new things, however, won’t help us find new solutions” well said. Just because something is new doesn’t mean that it makes sense for us all to be using it. Alot is being discussed now about the long term effects that all these gadgets have on our brains and on a persons ability to focus clearly. Good read thank you. Nice! I wonder though, how old the sympsons are and what would be next? The good parameter you are getting old is you are not getting simpson any more and your kids are. My educational skills will be upgraded with some of this recommendations. Thans for great postting. 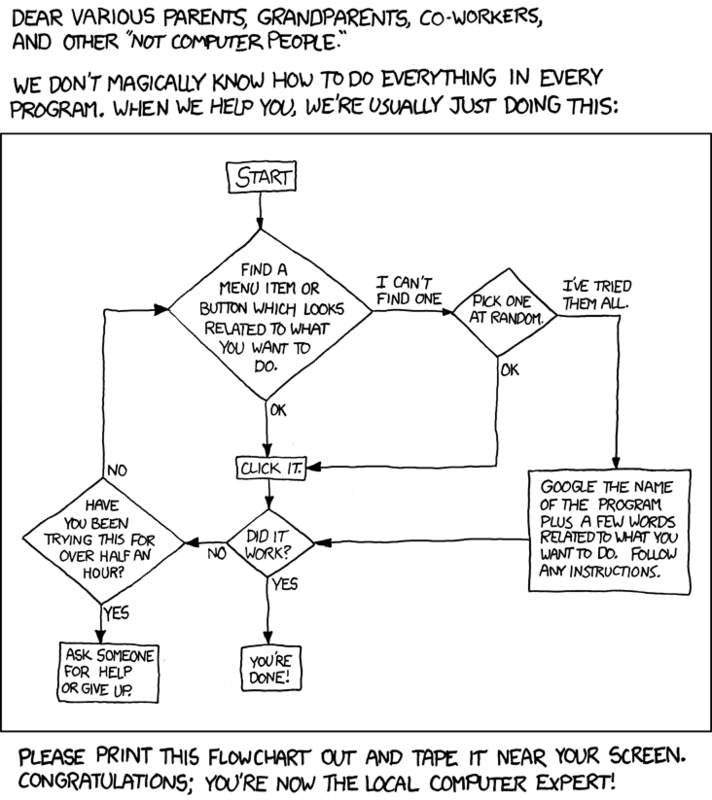 Yeah, I thought the flow chart was pretty good too. I’m one of those non computer people, and having someone do this trial and error thing is much easier than doing it myself. I also though the cartoon with talking about “reduce the number of people I have to ignore” hit the nail on the head. That’s the great thing about Facebook and Twitter now. I don’t have to email anyone with updates about what’ s going on. If you want to know, follow my tweets. If you’re curious, check my wall. Literacy is important to a person, to community and the country. It is a start to help a person alleviate himself to poverty. There are a lot of ways on how to teach literacy learning like the flowchart and the cartoon videos.